I get so excited when I have a commission piece to do! I enjoy the process of discussing the various options with the client, gathering resource materials, and deciding on a composition. It's a lot of work, but it's so much fun in the end when everyone is happy with the results. The stonework on the house was represented with strokes of watercolor applied with a small flat brush, and a touch of colored pencil line work. I wanted to suggest the texture without painting each and every stone. The blossoms on the tree add a splash of color. 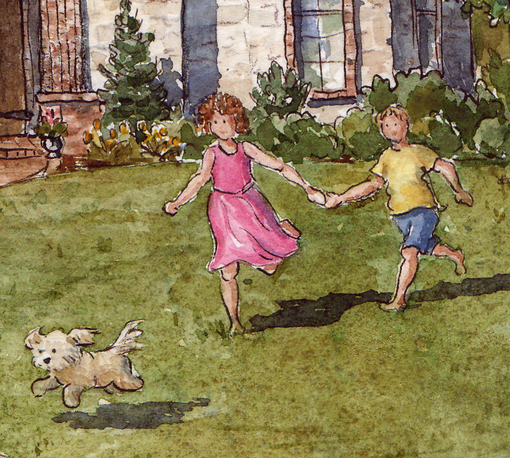 The children, Emma and Aiden, bring the painting to life, and their mom says this scene is a common one in their family - the kids love playing with the dogs in the front yard. House portraits can sometimes seem rather static, with nothing much going on. I like the fact that this one has a fun narrative, with the kids chasing Hadley, who's chasing the ball, and being watched by Ginger, who's taking in the whole scene from the sidelines. 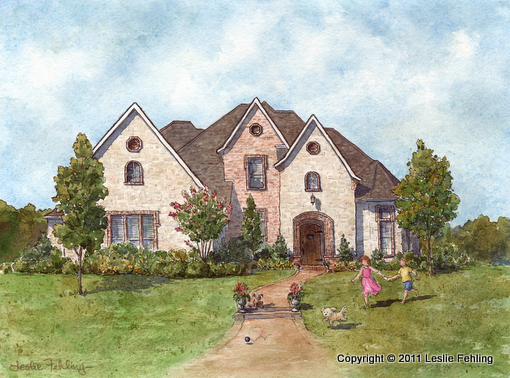 As I contemplated a title for the painting, I realized that the picture shows some of "The Best Things in Life" - home, children, pets, sunshine, flowers, simple fun, peace, and happiness. We can't ask for more than that. please email me using the Contact button in the right column. I'd love to create something special for you. One of the features of our house that I like the best is the kitchen and breakfast area. It's the space where everyone gathers to eat, play games, and just hang out. The breakfast room opens onto the sunroom, which offers great views of our yard and the fields and hills beyond. The color scheme for this area was built around my collection of antique flow blue plates, picked up at flea markets over the years. The walls are painted a muted grey-blue that contrasts nicely with the blue and white plates, and the white woodwork. The fireplace in the breakfast area is double sided - the far side opens to the living room. 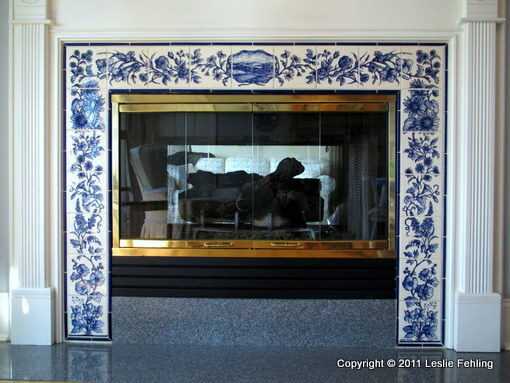 The tiles surrounding the fireplace were designed to coordinate with the blue and white tile backsplash in the kitchen (described in a previous post). 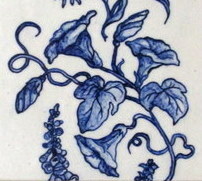 The botanical theme of the handpainted backsplash tiles was carried over onto the fireplace surround. 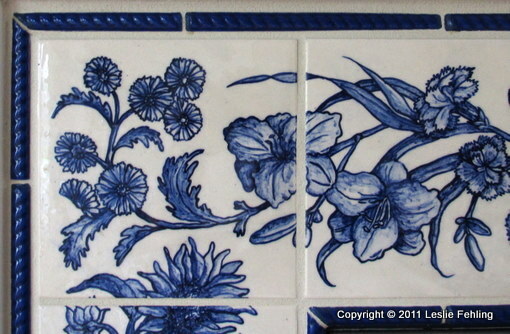 Instead of using culinary plants and herbs as subject matter, as I did on the kitchen backsplash, these tiles feature the flowers that grow in and around our yard. 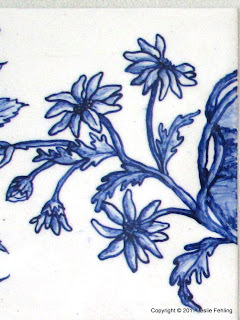 I selected 6" x 6" plain white bisque-fired tiles and painted my designs with a cobalt underglaze, just like in the kitchen. 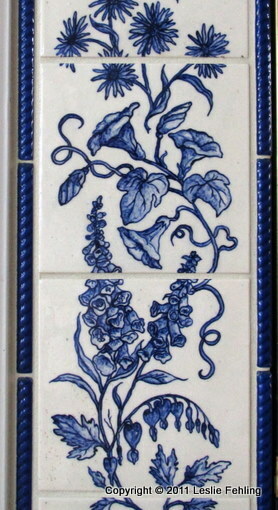 They are bordered by commercial rope trim tiles in a matching cobalt blue. The prominent center tile holds special meaning for our family. Before we built our new Victorian-style home, we lived just three miles away - two ridges over from the hilltop where we were building our new house. I used to walk to the top of the hill across the road from our old house, where I could look over (with binoculars) and see the building going on at the new house. 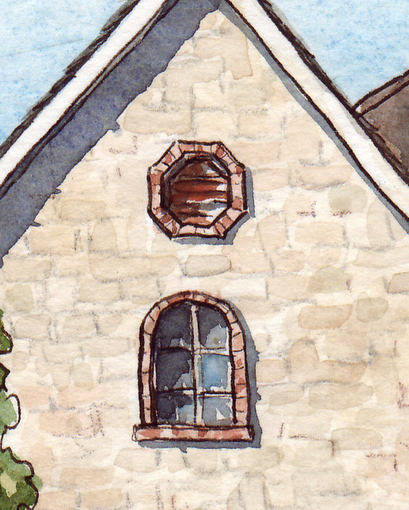 That view, from the home where we had lived for 20 years, to our new dream home, is what I painted on the tile. I love looking at it even now and remembering the twenty happy years we spent in the old house when the kids were little, and the excitement we felt as we watched the progress of the new house being built. The first flowers to the left and right of the center landscape are daisies. They grow wild in the fields and along the roadsides around here, and I also have Shasta daisies planted near the house. They're so cheery and hardy - I like non-fussy plants that take care of themselves. I love roses, so I had to give them a prominent place on my floral tiles. I have lots of them planted around our yard, and I've refined my selections over the years so that I only have varieties now that are fairly carefree. They don't need a lot of maintenance - just a little pruning now and then. To the left of the roses, I painted carnations. I like their spicy scent, and they remind me of high school corsages and cheap, colorful bouquets from the grocery store. The carnations blend into the daylilies. Daylilies are a staple in my landscaping, offering lots of midsummer color. It's fun to walk around the yard on a summer morning and see which ones are blooming that day. I can never decide which is my favorite. I love the soft, pale pink ones, and the apricot blush, but then I see the deep, dusky burgundy, with its velvety petals and I think, "That's it! That's the one!" The small flowers in the corner tile are pincushion mums. They really help to brighten up the fall landscape, when most of the summer flowers are waning. Sunflowers are great fun to draw. 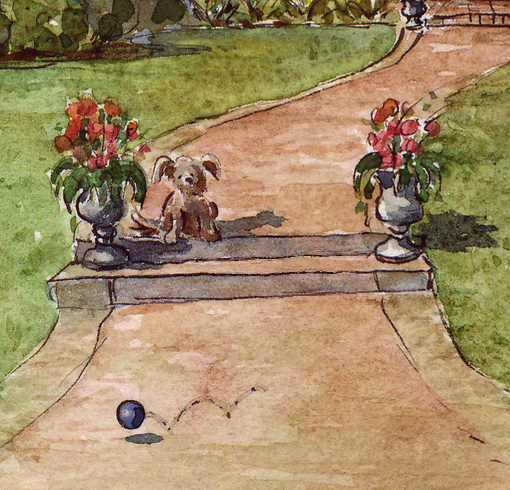 It was a given that they would play a prominent role in my painted garden. Every spring I'm drawn to those bright packets of sunflower seeds on display - I can't resist planting a row or two in the garden. We also have a crop of them that sprout each summer under the bird feeders from all the seeds that are scattered by rambunctious goldfinches and chickadees throughout the winter. Below the sunflowers are campanula and asters. 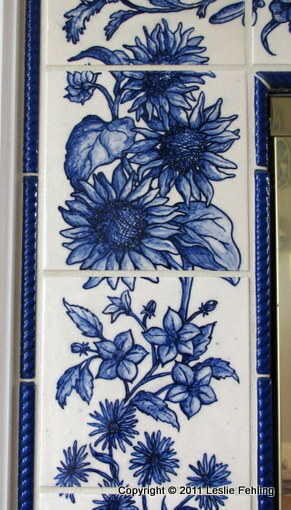 When choosing the flowers I wanted to include in my handpainted tiles, I not only picked some of my all-time favorites, but also strove for a variety of forms - big, showy plants like the sunflowers, and petite little things like the pincushion mums - spiky flowers like the asters, and lush, multi-petaled ones like the roses. Morning glories and foxgloves wind their way up toward the asters, with the curly tendrils of the morning glory vines filling in the spaces. Gracefully arching below the foxgloves is a single branch of bleeding heart. I also gave a nod to houseplants by including a gloxinia plant at the base of each side of the tile surround. Their blossoms are so pretty, and I like the interesting way the stems bend and droop. I love the way the handpainted tiles on our fireplace turned out. Every day, I sit in "my spot" at our breakfast room table so that I can look toward the fireplace and see all those pretty blue and white flowers. My kitchen is the thing I'll miss the most when I leave this place someday. There's so much of me in it. When we were building our house eleven years ago, I had my heart set on having a classic blue and white kitchen. 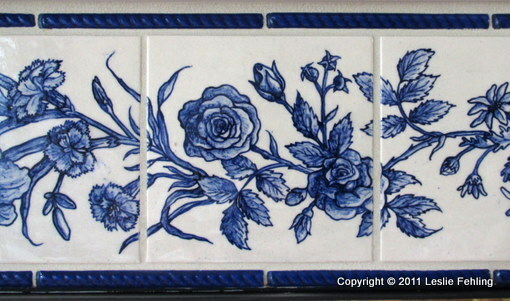 I found some beautiful, hand-painted blue and white Delft tiles at a local tile and stone shop, but when I started adding up the total cost to do the entire 30 linear feet of my kitchen backsplash, I realized the price was way out of my budget. But where there's a will, there's a way, and when I set my mind to something there's no stopping me! 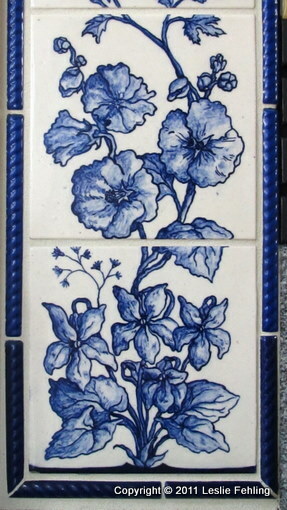 I found a way to have my blue and white tiles, and they were less expensive, and prettier, than anything I had seen in a store. My son was apprenticed at the time to a local potter, who was a great source of information and help. I found out that we could order plain, bisque-fired 4" square tiles from a ceramic supply company, and I could paint them myself. While the tiles were on order, I worked on the layout of the backsplash and the design of the tiles. With the house under construction, I had the opportunity to plan the spacing of the tiles, and the placement of the outlets in the backsplash so that they wouldn’t interfere with the pattern of the decorative tiles. It was quite a challenge to figure it all out – let’s just say I hope I don’t ever have to do it again! For the botanical designs on the decorative tiles, I was lucky enough to find a book called Medieval Herb, Plant, and Flower Illustrations, which has nearly 300 copyright-free botanical illustrations of herbs and flowers that I could use as a starting point for my designs. The drawings are based on a series of woodcuts from the 15th-century. I selected drawings of herbs and plants related to cooking, but couldn’t resist including a few others that I just liked the looks of. 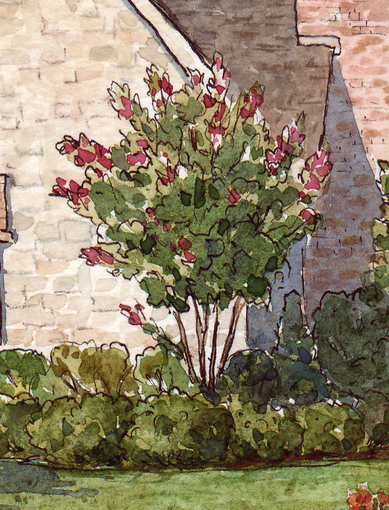 I also had to design the field tiles that would fill in the spaces between the botanicals. I experimented on paper and finally came up with a motif that I liked. Where four corners meet, a secondary pattern is formed. For the kitchen countertops, I planned to use a matte finish ivory tile, but I was stumped about what to do with the front edge. When I hit upon the idea of repeating the cobalt blue of the decorative backsplash in hand-painted edge tiles, my design was complete! After sketching out each of the 35 botanical tile designs on paper, I transferred them to the plain white 4” tiles. Then came the most challenging part – painting over the pencil lines with the cobalt underglaze. I had to be extremely careful not to smudge my work. If I made a mistake, the only way to correct it was to scrape away the glaze with an X-acto knife. Handling the tiles and packing them for transport to the kiln was tricky, too. An inadvertant move could wipe out hours of work. When the kiln was opened, I breathed a huge sigh of relief. My tiles had survived the firing and looked wonderful! I couldn’t wait to install them! All of my planning had paid off, and the installation went smoothly. I just had to take my time and not rush things. The whole project was a LOT of work, but it was worth it to me. Every once in awhile, I stop and look at my kitchen and marvel at the fact that I so blithely undertook such a challenging and time-consuming project. But I LOVE my blue and white tiles, and I get to enjoy my pretty kitchen every day. It's everyone's favorite place in our home. ... the breakfast room fireplace surround that coordinates with this kitchen backsplash.